Divers came across a mysterious and bizarre 26-foot-long sea creature that shifted its shape as it moved through the water. Incredible footage of the 'creature' stunned online viewers, who were captivated by how close the divers were able to get to it. Steve Hathaway and Andrew Buttle were diving in waters off the volcanic White Island, near New Zealand in October when they encountered the bizarre sighting. In the video, the hollow, worm-like creature can be seen moving slowly through the water, at times shuddering and pulsating in waves. Mr Hathaway and Mr Buttle were quick to identify the hollow creature as a pyrosome - a wormlike structure which serves as a colony of tiny sea organisms. The rare creature is made up of hundreds of thousands of smaller organisms. According to the Washington Post, scientists often refer to the creature as “bizarre unicorns of the sea” because of its bioluminescent glow and mysterious features. Some of the earliest reports of pyrosomes came from sailors in the 1800s who noticed their bright glow while sailing. Mr Hathaway said the diving pair had been filming footage for a promotional video of New Zealand's White Island. He said: "I’ve always wanted to see one. I’ve been underwater a lot, and I’ve seen a lot of animals. "Having never seen one in person or even footage or photos of one before, I was quite incredulous and elated that such a creature existed. "I know nature waits for nobody, and I couldn’t let this opportunity pass me by. "Even the most articulate person in the world couldn’t describe that creature that we filmed." White Island is owned by Mr Buttle's family, and is famous for its active volcano and diverse flora and fauna. 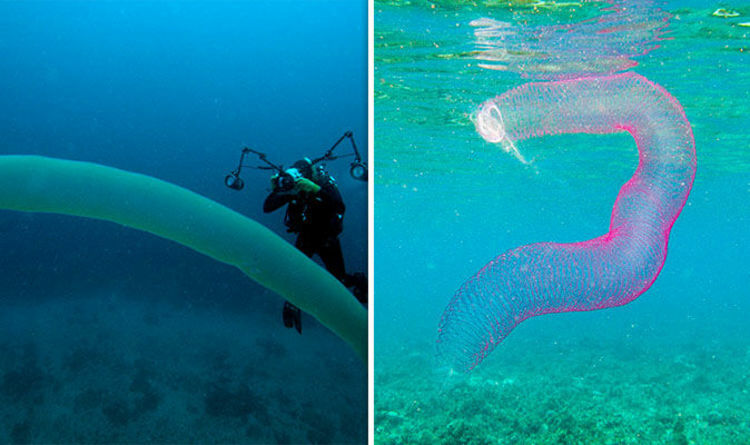 Linsey Sala, a scientist at the Scripps Institution of Oceanography in California, said pyrosomes near New Zealand and Australia reach up 45 to 60 feet long.